When we left off two weeks ago in our recap of our March visit to the Carolinas, we were heading east on I-40 from Asheville and the mountains of western North Carolina. Past Statesville, the landscape changes dramatically. Mountains give way to flat countryside, and the rural character of western North Carolina yields to a fast-growing suburbia known locally as "the Triad." The name comes from the three cities at the region's heart - Winston-Salem, Greensboro and High Point - but now applies to a wide swath of west central North Carolina that extends south to Asheboro and north almost to the Virginia border. Lexington, at the south end of the Triad, has one feature that appeals to tower buffs: a two-site AM operation. From Lexington, it's a short drive on I-85 to High Point. The smallest of the three central Triad cities, High Point is known internationally for its furniture industry - and indeed, the whole town sort of smells of furniture lacquer. There must not be a lot of activity in High Point - at least, that's the only explanation we can think of for why our tower-hunting activity suddenly attracted the attention of the local constabulary. Granted, it was just a few days after the start of the war - but do you see anything that looks sensitive in the photo to the left? 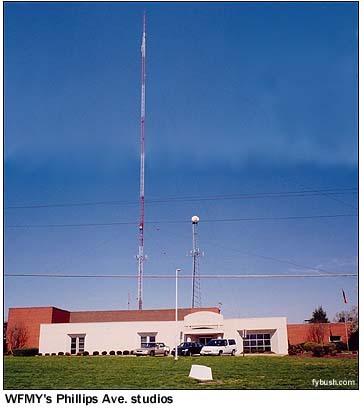 That's WHPE (95.5), the Triad outlet for the Bible Broadcasting Network and a very old FM facility, tracing its history all the way back to the forties and the High Point Enterprise newspaper, which put WHPE on the air as one of the region's first FM facilities. 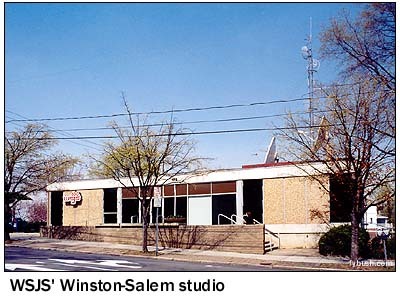 WHPE went religious in the sixties and hasn't changed much since; like so many Bible Broadcasting Network facilities, it's run primarily from network headquarters down in Charlotte, with the local studio staffed only a few hours a week. Southeast of High Point are some tall towers for the Greensboro TV stations: CBS affiliate WFMY (Channel 2) belongs to the owns the very tall one at left, with the candelabra behind it playing host to UPN affiliate WUPN (Channel 48) and the DTV for its sister station, ABC affiliate WXLV (Channel 45), as well as the DTV for religious WLXI (Channel 61). 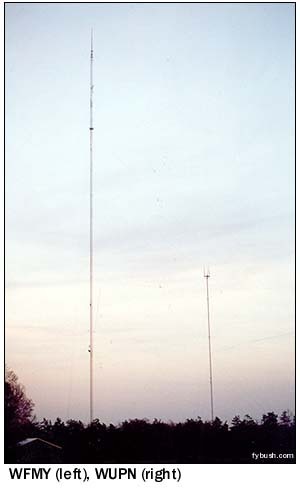 Another tower just south of here is home to WKRR (92.3); just a few miles further south, near US 311 and the town of Randleman, is the equally tall tower of High Point-licensed WGHP (Channel 8), once the ABC affiliate but now a Fox O&O. We'd made contact by e-mail with Jackson Armstrong, the legendary DJ who made a name for himself in the early seventies at stations such as WKBW, Buffalo and KTNQ/KHTZ, Los Angeles. Jack now calls the Triad home, and for the last few years he's woken up the oldies audience at WMQX (93.1 Winston-Salem), part of the Entercom cluster in town. A few months ago, he added a new task to his Entercom duties: voicetracking nights at WWKB (1520 Buffalo), the reborn "KB Radio," where we've become regular listeners. 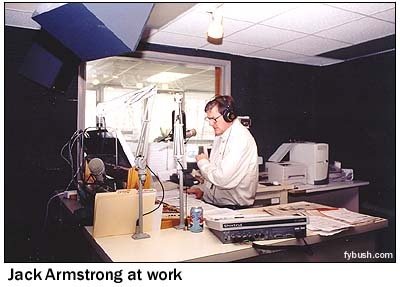 And so it's a thrill to get to sit in for a little bit of Jack's morning show on "Oldies 93," even though the Armstrong Winston-Salem listeners hear is a much more subdued version of the screaming night jock that Armstrong was (and still is on KB). No sidekick here - and "The Gorilla" was a bit camera-shy that morning - so it's just Jackson and his news guy for a 5-10 AM shift every day. 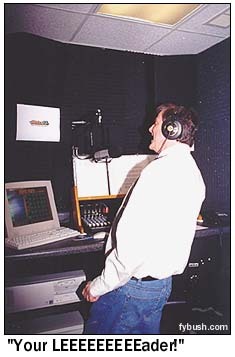 When the WMQX show is over, Jack heads around the corner to a little booth off the newsroom, where he plugs into an ISDN line to Buffalo and whips through his 6-10 PM show, with a producer at the KB end of the line feeding him the ends of songs as he goes. This cluster also includes two big urban FMs (WJMH 102.1 Reidsville and WQMG 97.1 Greensboro), hot AC WOZN (98.7 Greensboro) and two gospel AMs, WPET (950 Greensboro) and WEAL (1510 Greensboro). 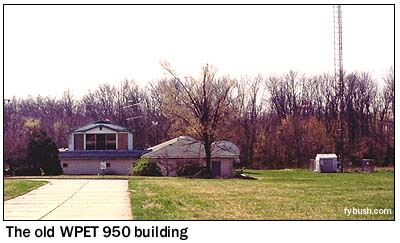 This building may soon be history, though; WPET holds a CP to move to the WEAL site, a shorter tower just south of downtown Greensboro, leaving this site behind. 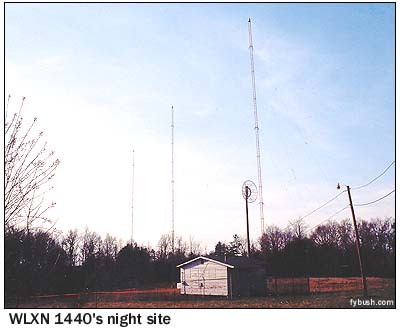 From a broadcast standpoint, there's not much else to note in downtown Greensboro - the short tower of WKEW (1400) and class D WUAG (103.1) - but there are some interesting sites on the outskirts of town. On the northeast side of Greensboro, just off the US 29 freeway, CBS affiliate WFMY (Channel 2) sits in a remodeled building at 1615 Phillips Avenue. 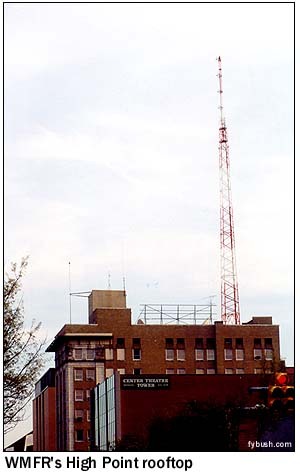 The tower out back, complete with an auxiliary set of channel 2 batwings (as seen in the photomontage below), is testament to this station's long history at the same site - until the new stick went up out near High Point, this was WFMY's studio and transmitter site. Winston-Salem is about half an hour to the west in some heavy traffic on I-40, and the AM dial is a little quieter than we'd expected: WAAA (980) and WSMX (1500) are both off the air, though WSMX's towers on the east side of town are at least still standing. 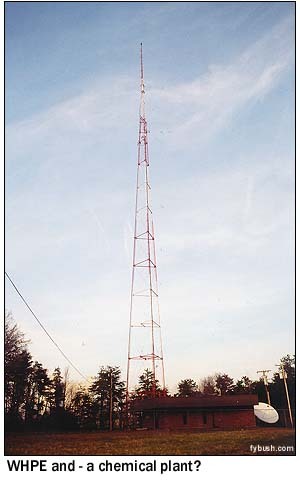 We skip the WPOL (1340) tower south of downtown (it's simulcasting with WKEW over in Greensboro), make a quick stop at the tower and studios of WBFJ (1550) north of downtown (from which we can see the WPIP 880 tower a few blocks away), then head out to the west side of downtown and the biggest AM signal in town: WSJS (600). 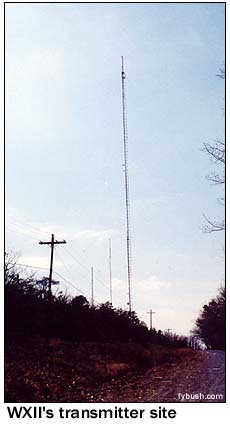 Winston-Salem's VHF station, channel 12, used to be WSJS-TV. 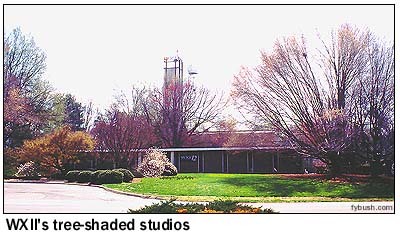 Today it's WXII, affiliated with NBC and owned by Hearst-Argyle, operating from a studio building northwest of downtown on Coliseum Drive. Keep heading west from WXII and you end up on Robinhood Road, where WSJS's four towers probably sat in splendid isolation as recently as a decade ago. Now they're surrounded by McMansions almost to the edge of the ground system, as this area becomes the ritzy part of Winston-Salem's exurban sprawl. Wonder if the neighbors are surprised to hear Rush Limbaugh on their toasters? If we had more time, we could head east to the WTRU (830 Kernersville) site, which cranks out 50 kilowatts by day but drops down to 10 kilowatts at night; we're headed north to Roanoke before the day is out, though, so instead we head north on NC 66 to Flat Rock and Sauratown Mountain, home to WXII, WXLV (Channel 45, the Sinclair ABC affiliate that dropped local news a few months before our visit) and public TV WUNL (Channel 26), as well as WTQR (104.1 Winston-Salem, the old WSJS-FM). Alas, a gate keeps us from getting all the way to the towers, but we can at least offer this view. And there's one more stop before we cross the North Carolina-Virginia state line: Andy Griffith's hometown of Mount Airy. We expected a very Mayberry-like town, but as the rain started to roll in, there didn't seem to be much Mayberry in downtown Mount Airy - so we retreated to a Subway for lunch while rolling tape on one of the neatest AM stations of the whole trip. 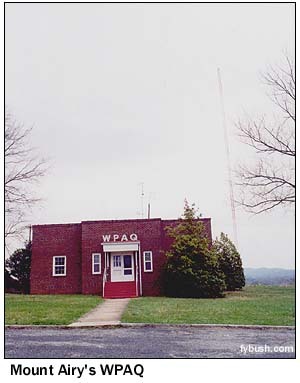 WPAQ (740) was built by Ralph Epperson way back in 1948 - and nothing much has happened to it since. That's a good thing: if you tune into WPAQ during its daylight hours of operation, you'll hear old-time bluegrass music, and it's not unusual for a local musician to drop in to sit for a spell and pick some tunes, live on the air. We should have stopped in to say hi; we're told that the inside of this little brick building is a veritable museum of old-time radio! Guess we need to plan a return visit...and perhaps when we do, the other AM in Mount Airy, WSYD (1300), will at least do a local ID. Next week, we'll continue our journey, crossing the line into Virginia and checking out the sights (and sites) of Roanoke! Want to see more neat sticks all year round? 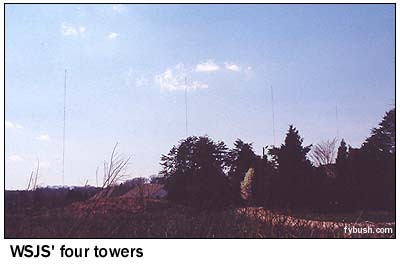 Nashville's WSM (at right) is one of the more than a dozen Tower Site images featured in the 2003 Tower Site Calendar, still available from Tower Site of the Week and fybush.com. If you liked last year's edition, you'll love this one: higher-quality images (in addition to WSM, this year's edition includes Providence's WHJJ; Mount Mansfield, Vermont; Buffalo's WBEN; KOMA in Oklahoma City; WTIC, Hartford; Brookmans Park, England; WPAT, Paterson; Four Times Square, New York; WIBC in Indianapolis; WWVA in Wheeling, W.V. ; WGN Chicago and more), more dates in radio history, a convenient hole for hanging - and we'll even make sure all the dates fall on the right days! This year's edition is still available in limited quantities! And this year, you can order with your Visa, MasterCard, Discover or American Express by using the handy link below! 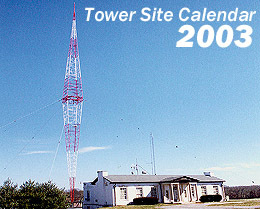 Click here to order your 2003 Tower Site Calendar by credit card! You can also order by mail; just send a check for $16 per calendar (NYS residents add 8% sales tax), shipping included, to Scott Fybush, 92 Bonnie Brae Ave., Rochester NY 14618.